South Africa have secured the Freedom series with a match to spare after their 135-run victory in the second Test at Supersport Park in Centurion. Lungi Ngidi (6/39) was the man of the moment for the hosts as he picked up wickets of Hardik Pandya, R Ashwin, and M Shami on the final day of the match. Brief Scores : South Africa 335 (Aiden Markram 94, Hashim Amla 82; R Ashwin 4/113, Ishant Sharma 3/46) & 258 (AB de Villiers 80, Dean Elgar 61, Mohammed Shami 4/49, Jasprit Bumrah 3/70) beat India 307 (Virat Kohli 153, Morne Morkel 4-60) & 151 (Rohit Sharma 47, Mohammed Shami 28; Lungi Ngidi 6/39, Kagiso Rabada 3/9) by 135 runs. After winning the toss, Faf du Plessis chose to bat first and the openers responded to the call by valiantly putting up an 85-run partnership before Ravichandran Ashwin removed Dean Elgar to give India the first strike of the match. But Aiden Markram was steady at one end and partnered Hashim Amla went on to forge a 63-run partnership before becoming the off-spinner’s second victim, scoring 94 runs. Although AB de Villiers managed to float in the wicket for some time, Ishant Sharma breached his defense before Amla and du Plessis retained control with a 47-run partnership. The slide, however, happened quickly and it was started by a superb piece of fielding from Pandya, who responded to Amla's quick single in his follow-through by getting to the ball sharply, swivelling in his throw to knock down the stumps at the non-striker's end to send Amla packing for 82. 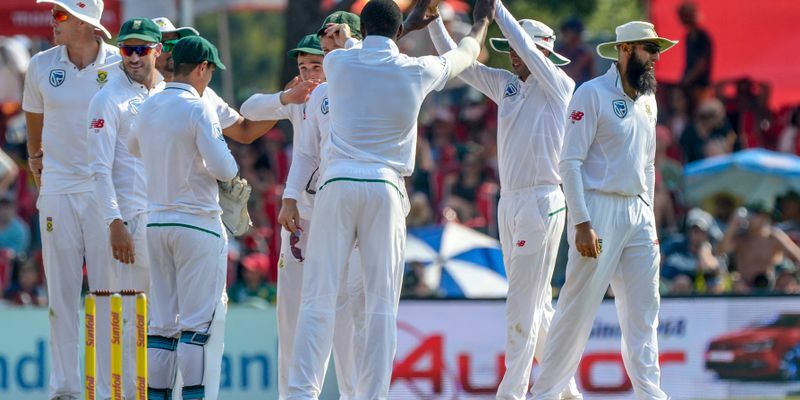 Quinton de Kock was out first delivery to Ashwin, edging him to slip to continue his wretched run against off-spinners and Vernon Philander added more worries to the hosts’ dressing room by being the second run-out on the day and South Africa ended the day with 269/6. Starting the innings from 269/6, Indian bowlers, especially Ashwin, bowled with a lot of panache but saw catches being dropped. No less than three catches were put down in less than two hours and taking a benefit of that, the South African skipper punished India for the mistakes, farming the strike and shepherding the tail well past 300 until Ishant castled him when the score was 333/9. India’s innings started in typical fashion as KL Rahul and Cheteshwar Pujara got out in back-to-back balls that reduced India to a paltry 28/2. But with Kohli being on the crease, Indians hopes were pinned on him and he didn’t disappoint. But after a nice 79-run partnership, Vijay’s unwanted bit of adventurousness against Keshav Maharaj cost him his wicket. While the skipper was no less than a picture of composure at one end, a familiar collapse ensued in the middle order that left India with 164/5. However, Pandya came out with a calm head on his shoulders and ensured that not only did he support to Kohli, but also that there would be no more casualties before stumps. With Kohli on the crease, India were expected to go close to South Africa’s innings and the skipper made sure that as well. But Pandya failed to last long and was carelessly run-out for 15. Kohli, however, displayed a wide range of strokes to score at a quick rate and got ample amount of support from Ashwin, who batted with purpose and made the most of South Africa’s laxy nature on the field. Although initially, Ashwin happened to keep most of the strikes, Kohli got into the mix soon and the duo continued to frustrate the hosts. After having survived an edge off Maharaj, Ashwin played a splendid inside-out shot off the left-arm spinner to release the pressure. But when the new ball was taken, Philander then had him caught at second slip by du Plessis and India eventually ended their innings with 307 runs, 28 runs adrift of the South African innings. While the African nation wanted to put on some score to mount pressure on the visitors, they were reduced to 60/2 as Bumrah provided breakthrough by trapping Markram for 1 before dismissing Amla for the same score. Starting the day at 90/2, de Villiers and Elgar got off to a slow start so as to maintain control on proceedings and to counter any movement that the ball could offer due to a few showers a day earlier. The duo played out more than 10 overs to add 54 runs to the tally before Shami ran riot getting rid of both the set batsmen along with de Kock in a matter of four overs. With South Africa struggling at 165/5, India looked on the ascendency, but du Plessis came up with another brilliant innings to swing the momentum back in the hosts’ favour. When Ishant finally got rid of Philander and Maharaj in his next over, South Africa had already gone past the 200-run mark. Du Plessis then went on to forge another 30 run partnership with Rabada before the pair were sent packing as India rounded up the innings for 258 setting themselves a target of 287 to level the series. With the pitch playing spoilsport, India were looking to at a steep target and their chase became even harder as both openers, Vijay and Rahul made their way into the dressing room with just 16 runs on the board. The day soon turned nightmarish as Kohli was sent packing as well for a mere 5 runs. With Pujara and Parthiv at the crease, India managed to reach a score of 35/3 at the end of the day’s play. With Kohli already enjoying the comforts of the dressing room, India needed Parthiv and Pujara to stand up to the occasion, but the latter’s lack of athleticism made sure that he became the first player since Stephen Fleming in 2000 to be run-out in both the innings of a Test match. For South Africa, the series was all but sealed by then and Parthiv decided to open the floodgates a little more by trying to pull a Rabada short ball to backward square leg and Morkel, running in from fine-leg, took a screamer that was pretty much reminiscent of Glenn McGrath’s catch to send Michael Vaughan packing in the 2000 Ashes. Even though Pandya didn’t last long, Shami and Rohit gave the Indian fans some hope with a 54-run partnership. However, once Rohit was dismissed by a brilliant catch by de Villiers in the deep, the match result was not in question anymore. There was still time to put some icing on the cake though as Ngidi completed a sixfer on his debut to secure a 135 run victory.